Now, I know there’s a lot that goes into these types of promotions. You’ve got some big players — McDonald’s, LEGO, Warner Brothers (DC Comics), and the video game studio. They’ve got to sit down and sign a contract to do the promotion. Artwork needs to be supplied for the boxes & to make toy models based upon. Approval needs to go into the models in different stages. The physical toys need to be produced, enough to go into Happy Meals world-wide. And it all has to be timed with the release of the video game. And I’m sure there’s several steps that I’m missing. 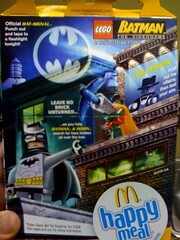 In the back of mind, I know LEGO has made sets for McD’s promotions in the past. And since Batman has been out for a number of years, the parts still have to be in production. So, why wasn’t real LEGO used in this promotion? It has to be cheaper on some level… to model something in real LEGO parts vs. having to design molded plastic toys based on models & minifigs. On some level, it blows me away that instead of receiving ‘LEGO’ as my Happy Meal toy (which is a toy in of itself), you get a molded cheaper plastic toy based a real toy — very surreal. Or is this the new toy collector mentality seeming to invade the LEGO fan collective consciousness? In today’s consumer safe world, McDonalds can not give away toys that are consider small part and pose a choking hazard to any aged kid. Thus you get large chucks of plastic. The days of McDonalds giving away real Legos have been over ruled by the lawyers in the back rooms of corporate America.